There's always time for a glass of wine with Sorbus® Butterfly Wine Rack! This creatively designed 360° view wine rack conveniently holds up to 8 bottles of your favorite wine. Each wine bottle is stored horizontally ensuring both the wine and the air bubbles are in contact with the cork. Keeping corks moist enables wine to stay fresh longer until you're ready to enjoy. The rack is constructed of lightweight, durable wood. It purposely designed with a sleek and chic look to accent any home, kitchen, countertop, or bar table. 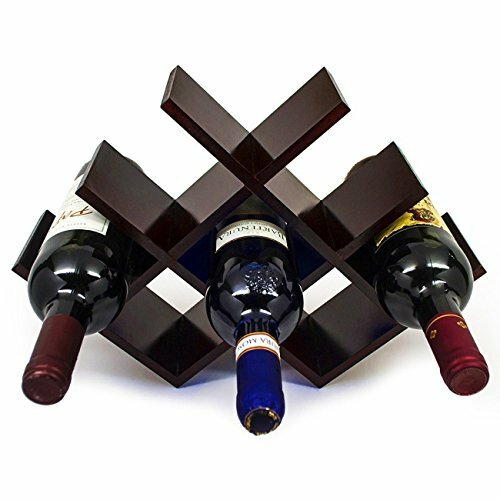 This butterfly wine rack also makes a great gift for that wine aficionado in your life or for any special occasion. It features 360° views so that you can not only see the wine but also grab and go from both the front and the back. This wine rack can be easily cleaned with a dry cloth for lasting quality years of use. Minimal assembly is required. It measures approximately 17.25"x11.5"x4" and holds most standard wine bottles. You can't buy happiness but you can buy this beautiful butterfly wine rack and that's pretty much the same thing!